Another addition to the instant 3-minute dhokla recipe series after the basic 3-minute microwave dhokla, Dhokla in idli stand, Rawa Dhokla, Instant khatta dhokla and Poha Dhokla is this quick and easy, lovely and vibrant colored, healthy and tasty Beetroot Dhokla..
Just like all the other dhokla recipes previously shared, this lovely dhokla also gets ready in just 3 minutes in the microwave, or can be steamed in the normal stove top steamer. It takes about 10-12 minutes in the steamer and you can check by doing a toothpick test. 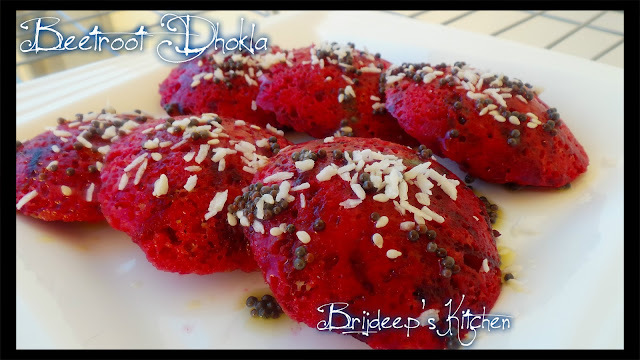 I have prepared this dhokla in my Idli mold in microwave, you can prepare in the regular dhokla mold or in idli mold, both in microwave and on stove top. 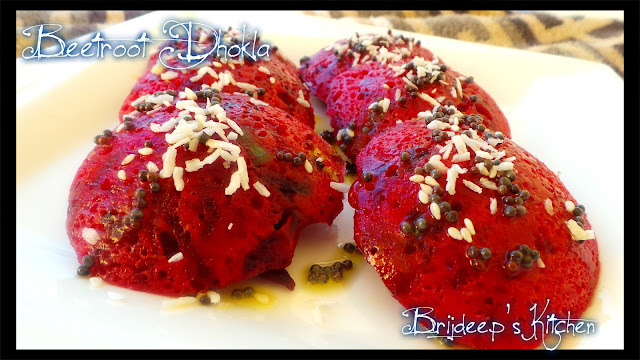 Grate the beetroot and mix in the semolina, lemon juice, salt and sugar and mix well. Keep aside for 20 minutes. After 20 minutes, mix everything well again, do not add any water, the batter will be little watery because of the beetroot. 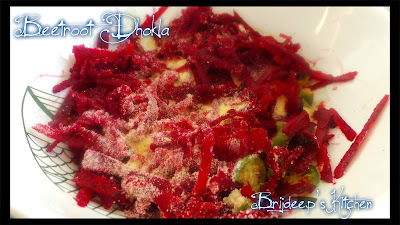 Add in the fruit salt and quickly mix well. Pour the mix into greased idli molds. Cover and steam in the microwave for 3 minutes on highest power. It can vary with power, for maximum 750 W, microwave for 3 minutes, for 700 W, 4 minutes and for 1000 W, for just 2 minutes. 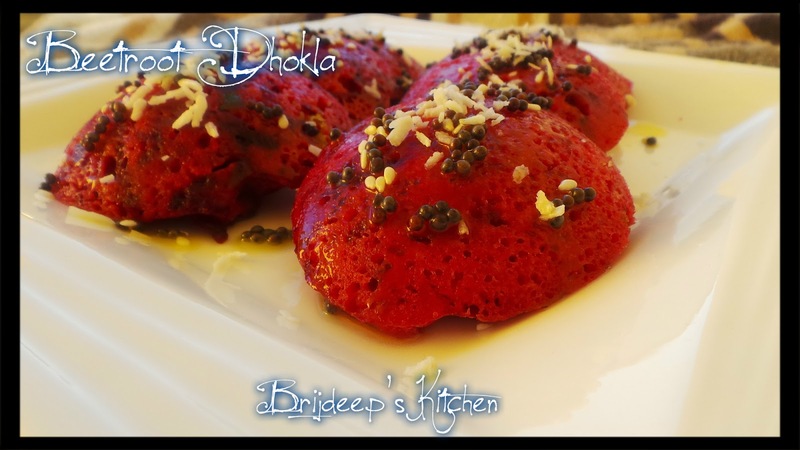 Remove and do the toothpick test, if the toothpick comes out clean, then the dhokla is done. If not, microwave or steam for another minute. Make the tempering: Heat oil and crackle the mustard seeds. Next, crackle the sesame seeds and turn off the flame. 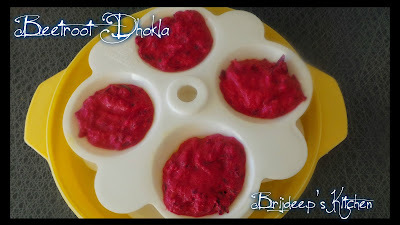 Pour this tempering over the dhoklas and garnish with desiccated coconut. Serve with Mint-coriander chutney at tea-time or as breakfast. Loved this recipe? 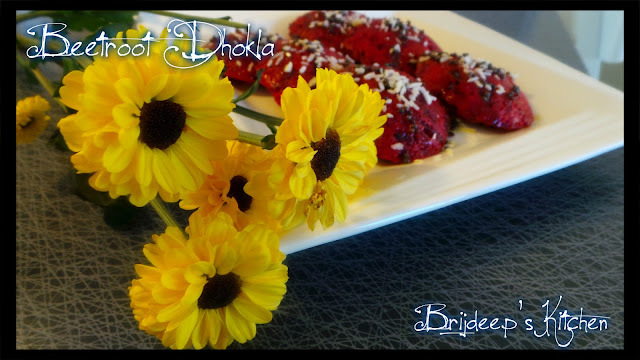 Connect with me on Facebook for regular recipe updates. 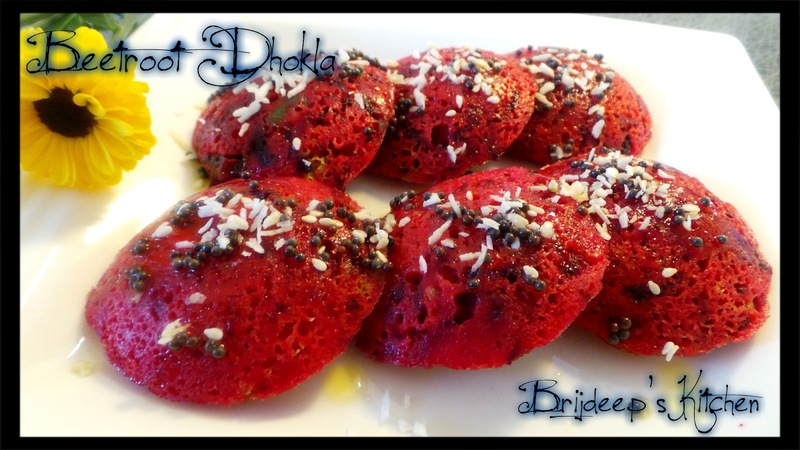 Beetroot Dhokla ? it looks like Red idli.